From previous feedback, we have scheduled this event during SATs week. 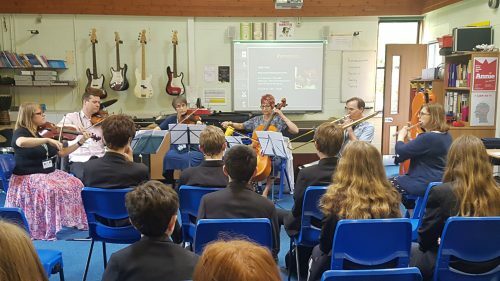 Book a performance to inspire and motivate your pupils to take up an instrument, or perhaps as a precursor to a Whole Class Ensemble Teaching programme. Our musicians will be in your school for 1 hour, which includes a performance of 45 minutes. We are interested in suggestions from schools for possible themes or styles that will engage your pupils in a bespoke way. Anything from Bollywood to Grime…surprise us! or £50 for schools signed up to a Premium Hub Subscription Package or on a WCIT programme for 2018/19. Booking for Live Music Week 2019 is now closed.